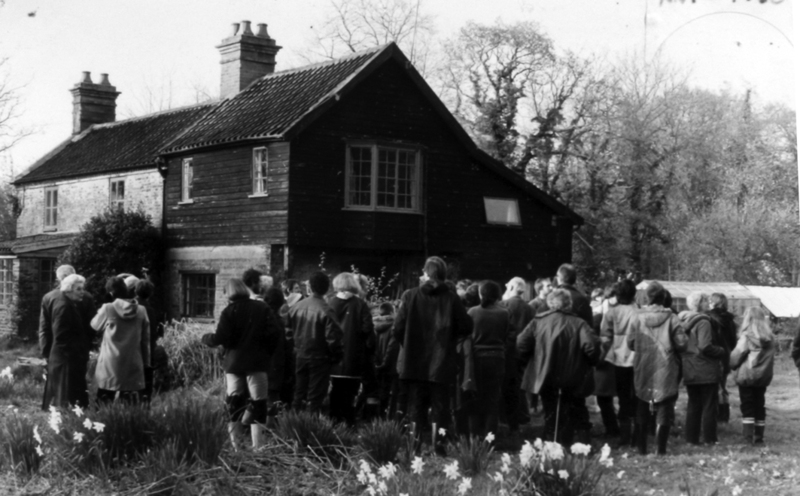 In a wide ranging interview with WISEArchive, Suzie Hanna provides a fascinating insight about her childhood experiences growing up on Wheatfen Broad as a child of the well-known Ted and Phyllis Ellis. 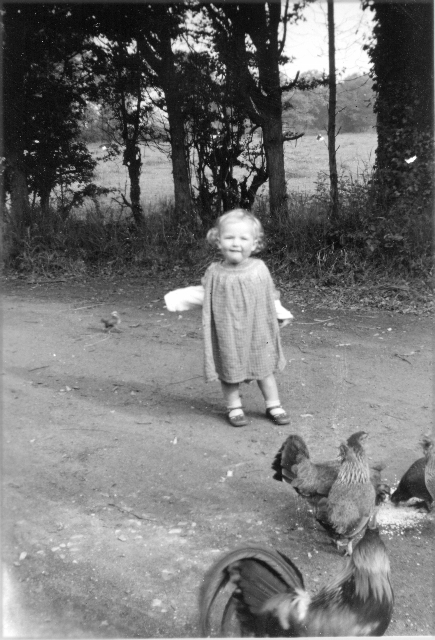 I’m the youngest of five children, born at Wheatfen Broad near Surlingham in November 1953. Russell Sewell also lived here, as did my paternal grandmother, Alice Ellis. She died when I was about four. 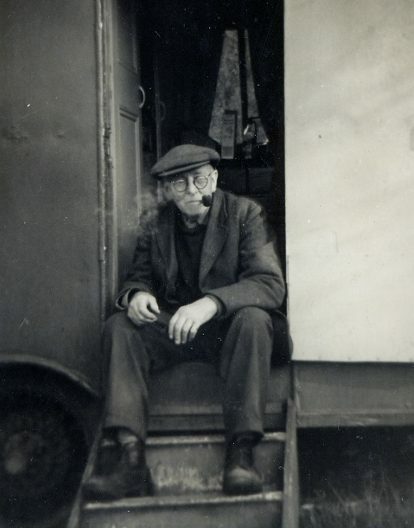 My maternal grandfather, Jack Chambers, then came to live with us in a caravan in the woods until he became too disabled to stay on his own. This was my family growing up. The cottage is two woodman’s cottages poorly built with local bricks; there were brick works in the village. The house is likely built from clay dug from the pit at the top of the field next to it. We think it was built about 1825 because it wasn’t on the 1820 map. Captain Maurice Cockle and his wife bought the cottages in 1914 as a shooting estate – about 140 acres including a wood. My parents knew him and made many visits. 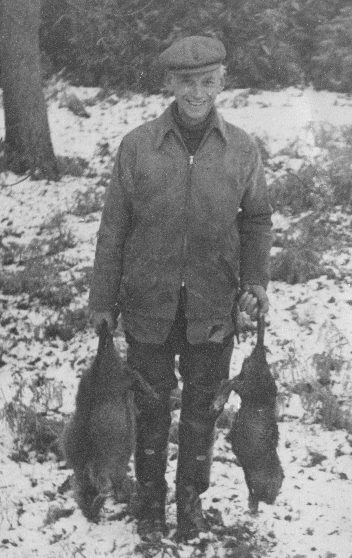 He and my father shared an interest in wetland naturalist issues; small things: mosses, algae and wildlife. When Captain Cockle died during the war in the early ‘40s, my parents arranged to rent the property from his widow. They bought the property in the ‘60s. There was no running water or electricity. We got water from a well which wasn’t palatable and had to be boiled, which had an effect on our diet. So we drank a vast amount of tea and mum used to brew ginger beer and elderflower champagne; we couldn’t have orange squash or anything like that. Life was quite tough. My sister, Lucy, and I remember sitting on either side of a fallen tree with a two-handed saw taking it in turns to pull on it. Mum would sell it to us as ‘oh, it’s a bit like a see-saw. It’s fun sawing up logs.’ I was four at the time. We would often be in charge of the table. We had this massive Georgian table with many leaves which you had to slot in little bits of brass. As you laid the places you said the person’s name to ensure you got everybody; remembering names was an exercise. It was dad’s table when he was the Secretary of the Norfolk Naturalists Trust. When they were clearing out they let him have it. We needed it because you could have around 20 people round this table. My brother John has this in his house now. We used the table for card games and board games too. A favourite was Racing Demons which is like everybody playing patience in a big pile. The person with the longest arms and hardest hands would usually win because they could slap their card down and frighten you; my brother Martin, who grew to six foot seven, was extremely good at this game. It was a fight but very funny; we would be in stitches. We also played Monopoly, Canasta, Crib and Pit. Pit was a stocks and shares game and it was brilliant. My brothers have more serious stories about their walk to school: miles over the fields to Claxton, even as small children. I think they had it tougher than I did. I’m the youngest and we had a few more comforts by then. Mother cooked on a Rayburn but cooked breakfast on a primus stove because the Rayburn wasn’t hot enough to cook breakfast. We had a wood fire in the front room. We did our homework in winter by the light of a Tilley lamp and took one with us when we went to bed at night. We let the pressure out and went to bed stinking of paraffin. Winter was so cold we had ice on the inside of the windows and sometimes frost on the quilt. I sometimes put my school uniform in bed with me at night and put it on before I got out of bed. We had chilblains but there was a huge upside. We could go out in a boat, out onto the water, take picnics out, climb trees, make dens – I can’t tell you the number of times I cut myself on the bracken making dens. We had this wild, free life running about, digging holes, looking at stuff and growing things. We didn’t have pets like cats and dogs. Instead we had chickens, guinea pigs; we adopted things. We had a gosling who followed us about. Tradition continues with my daughter, Rose; we have a peacock, Fabio, who has come to live with us from somewhere. Things arrive, they live here and become almost like a pet. It’s part of country life. Country children have great fun with these things. We made bows and arrows out of hazel sticks. When we weren’t running around the woods and shouting loudly making as much noise as we liked, we made a lot of noise in the house. My maternal grandfather, Jack Chambers, was a postmaster in the Orford area when called up during the First World War. Mum was born in 1913 and was 18 months old at the time. Her mother took her to live at Sudbourne Hall because her mother’s father was the gamekeeper on the Sudbourne estate, and his wife was a kind of companion or housekeeper to Lady Clark. Lady Clark was the mother of Sir Kenneth Clark of Civilisation fame. She didn’t have any daughters and indulged my mother. I’m told she even spoke to grandmother about adopting her. I can imagine it because mum was a very bright child. Mum was put her to bed about six o’clock, and her grandmother would get her up a couple of hours later to make another hand at bridge with Lady Clark. Mum was very sharp at card games from about three years old; at four they took her to a Whist drive and she won! Lady Clark even paid for mum’s piano lessons on the grand piano in the ballroom at the hall. Mum was a good pianist and could sight read to a very, very old age. Even when she had vascular dementia at almost 90 she could still read music. She was playing the piano up to within a year of her death at 91. She encouraged music. I have played my great, great grandfather’s violin since seven. Lucy plays the violin a little bit better than I do. We still play together with my husband on the piano. We played Bach double D concerto and things like that. Mum was quite fierce about our practice and would facilitate it by playing for us to do duets, and she would play the piano. My grandad had a banjo and ocarina. Martin took the banjo from the wall and went to Newcastle University. He had a band that would sometimes stay at Wheatfen and play music. I’ve got photographs of us playing out in the yard. Mum would be banging saucepans or something. People were encouraged to pick something up and hit it if they couldn’t play. We always had a very musical life. We had a wind up record player with a lot of Gilbert and Sullivan, Stanley Holloway and I think my brothers bought Lonnie Donegan. When they got a battery-run reel-to-reel tape recorder we began to get more music in the house. My father wrote a few fairly decent songs. He sang all the time; you heard him coming. He always sang waltzes; had a passion for Viennese waltz or similar. When he was happy he sang a lot. He didn’t play anything but was very keen on writing; he could write them down. I think mum helped him because we have the manuscripts. He wrote the Wherry waltz, one about the procession with the dragon in Norwich, which is Snap the Dragon. I think we played the Wherry waltz at his funeral or memorial service. We still bring them out occasionally and give them a bit of an airing. I think teaching children to play music is incredibly good for them. It’s good for your memory, maths and self-regard. It’s another language which you can take with you wherever you go so I’m very grateful to my mother for it. At Christmas, mum would get on the piano and play Jerusalem the Holy City and we’d sing. We sang while washing, wiping up and in the kitchen. We can all sing harmonies and descants. She played the organ at Surlingham village church for forty, fifty years when she lived here until she could no longer play the organ. She played the organ every Sunday and we sang in the choir. We had to gown up and sing. We went carol singing in candle lit processions with little children being allowed to partake. It was very much the focus of the community in the village. To me it was never about belief but I loved things like Nunc Dimittis. Singing has a real atmosphere and feeling so I loved the emotion of it. I’m very grateful I know the songs, the hymns, and love singing even though I’m not religious. I’m very grateful for the experience because I think it gives you a good foundation and understanding of ways people think even if it’s not the way you think. Having an insight into religion is a useful position to have. I am more a believer in nature. My father certainly impressed. He said ‘well, I believe in reincarnation.’ ‘Do you?’ ‘Yes, you are my children’. I think his sense of the world approached a Gaia theory – more about the planet itself. In his mind, nature controlled life and death. He didn’t have a belief in Christianity, but in Nature. The Shepherd family, who owned Lessingham House, had children with names like Ebenezer, Old Testament names. The old rich families would have their own pews at the front of the church. The poorest man in the village stood at the back. It was like that and we had a little bit of advantage. The organ was up in the organ loft. As children we were often allowed to sit up there because you got a really privileged position which was great. You could look down on the congregation, hide behind the organ; it was great fun. Mrs. Riseborough in the village would pump the organ. She had this very fat dog whose stomach practically scraped the ground. She had to climb these steep wooden steps because the dog couldn’t go up them. We helped her carry her smelly dog up the stairs and she would pump the organ. It was probably the most exercise she had all week, so during quiet moments of prayers or the vicar’s sermon you would hear her tummy rumbling and sometimes something slightly worse. The amount of laughter you could get in the church was brilliant. My mother hated cats, but she took in Mrs. Riseborough’s cat, Tina, when she died. She felt some duty to her for the pumping. So Tina came to live with mum. At 3 o’clock in the afternoon Tina would go and sit at the end of the hall and meow loudly. Mum found out from somebody who knew Mrs. Riseborough that she used to go to bed at 3 o’clock in the afternoon and read to the cat. It’s all part of village life. I think my parents were part of the International Society; we stayed with families in other countries and children of those families stayed with us. There were some hilarious mismatches. My brother, Martin, had two French correspondents. Bernard Mernier and Olivier Boucoiron. I think that both came from extremely rich families. Mother’s theory was they managed to match everybody else, so this crazy family that lived in the woods without any utilities were paired with these two very rich families. I think Bernard’s father was a major shareholder in Elf petrol and Olivier’s was one of the biggest fruit farmers in Vaucluse in southern France. He owned copious vineyards, orchards and mushroom factories. Thousands of people seemed to work for him on the land. He lived in a kind of marble floored mansion in Appaillard near Avignon. We had very interesting cultural interventions. Because father was a naturalist, a scientist, he attracted the attention of the international society of scientists. We had the Japanese scientist, who discovered plankton under the ice in the Arctic, who gave us tips on how to keep our feet warm. If you were in the Arctic you put a blanket over the table, put a single candle underneath, then put your feet under the blanket so you wouldn’t get frostbite. This was quite good for Wheatfen because of the chilblains in winter. I remember Beki; she was the niece of King Freddie of Uganda. 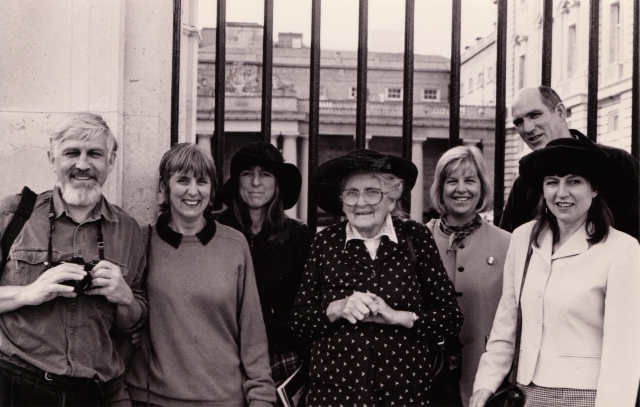 (She was at Durham University with my sister Mary.) There was an uprising in Uganda and King Freddie’s family was in danger so Beki spent the summer with us instead of going back home; this was pre Idi Amin. I came down one morning, aged about eleven, and saw this tall, very beautiful African princess ironing her hair with a flat iron on the hall table. Baron de Worms was an expert on something arboreal, possibly lichens, and he was an eccentric Austrian. Our mother said ‘if you pick your nose you’ll get worms’. He sat at the table with his little finger up his nose and he was called De Worms which to us was hilarious. Sometimes we had to leave the table because we were laughing so much; we were in trouble for laughing at him. I know he was revered in his subject area but a very odd character. Then we had mycologists from Kew Gardens. Dr Dennis had a beard seemingly down to his waist, very thick pebble glasses and rode a motorbike. Our lives were full of these extraordinarily eccentric characters. Our mother was really good at Christmas stockings; always a tangerine (satsumas didn’t seem to exist), walnuts and very odd things she collected from various places during the year. One Christmas there was very little in our stockings because six people had arrived the night before. They slept on mattresses somewhere in the house and mum divided the Christmas stocking contents between all of us. I remember feeling slightly excited to have these French speakers in the house and slight resentment we got poor stockings. Their lives were different to ours; it was very exciting. Out here in the deepest, darkest recesses of the muddy Norfolk fen we had a multicultural society in our house, and an open door policy. This meant it was frenetic a lot of the time around cooking, cleaning up and washing up. My brother-in-law, Colin who married Mary later, said he felt sorry for me as I was always called ‘somebody’. When he came round the first time in the 1960s he would hear mum shout ‘somebody do this’, ‘somebody wash up’, ‘somebody clear the table’, ‘somebody polish the table’, ‘somebody go and get some wood’. I was the last one left at home! Russell was born in 1900 here at Wheatfen as one of 13 children. His mother was born out of wedlock in the village, and her grandmother brought her up as a hidden child because of the shame. His father was orphaned with his brother and put in a workhouse in Surlingham. At 11 or 12 years old they were put on separate Australia-bound ships as cabin boys and he never saw his brother again. Years later he returned to the village. He was a woodsman here and married a girl kept from the light of day. Of their 13 children, only one, Billy, married and had a child. At three years old, Russell was getting water from the well when the handle came back and banged him on the head knocking him out for days. After that he was treated as if he was stupid – he wasn’t. He told me terrible stories about going to Surlingham school. A strict Methodist teacher would beat the children, and Russell was beaten because he had no shoes. He didn’t go to school because he had no shoes and then he was beaten for not going to school. What really upset Russell was how this man would beat his dog, which he thought was worse than beating children. He had a really tough life and lived to the age of 83 which I think is remarkable. He and his brothers took the string from sacks on the farm, weave a net and at night run down a field with it to catch pheasants as they flew up. It was their form of poaching. I think they could have been hung for it but they were desperately hungry. Can you imagine these little thin boys running down the field? It’s like fishermen but out on a cornfield. Russell was very enterprising and independent. Leaving school at, maybe, 12 and at 14 he worked round the farms. He bought himself a tractor and hired himself out. He was a reed cutter in the winter and looked after himself; I don’t think he ever had a girlfriend. He looked very young for his age. At 30 he tried to get a drink in the pub and they wouldn’t serve him! My parents knew him because he worked for the Cockles. He was a really great handy man and the Cockles loved him. He tended the garden. When my parents moved in he saw mum was in trouble trying to live here, and helped her out for which she’d cook him a meal. He lived with his sisters and a brother. It wasn’t a happy situation in the village; he didn’t like living there and only got on with his sister Violet, who was lovely. Mum suggested coming to an arrangement for him to stay with us. He refused. One day there was a terrible storm and mum said ‘look, just stay the night ‘cause, you know, some trees might go over.’ He was half way back and a tree came down. He came back and did a deal: effectively free board and lodging for the rest of your life, while tending the garden and cutting reeds on the premises. He became a part of the family. Mum was very friendly with Russell always doing the garden with him. It was a separate life to dad who was always looking down his microscope, at his typewriter, studying, or off doing something. Mum probably spent more time with Russell and I think my father might have found it challenging – not getting enough attention. I think he had a tough time living with both my parents. Russell was a proper marshman and such a good influence on us. He would say ‘come along with me, I’ve got something to show yer’ and we’d go up the wood. About a mile of walking we’d find a mushroom and it would have a natural smiley face on it. ‘Look at that!’ He’d let us carve our names on young marrows and they’d grow with your name in big letters. He engaged us with things like that. He’d play with us in a way that connected us with him through nature. We lived off the land and Russell Sewell did the garden. He grew masses of wonderful vegetables and fruit. I suppose we had a healthy diet – lot of pastry though. We had apple crumble, pies, cakes, vegetables from the garden and things that were shot like pheasants, pigeons and rabbits. We had a lot of game in our diet. Mum came from Gorleston and loved fish, so we got herring from the market. We remained fairly healthy from this early childhood diet. If it wasn’t for Russell we wouldn’t have eaten so well. My husband does most of the gardening now and I do lots of planting and stuff; I’m always thinking what Russell would think of this. This vegetable garden’s been here since the cottages were built; tons of food has been grown and I love to think of it carrying on with this slightly wild garden. You can’t control it here; everything grows. It’s so wet you can’t keep the garden free of weeds; you have to allow nature to sit in there as well. You could always pick yourself a bit of parsley or lovely fresh vegetables. That was good country life. Mum and dad would rent the Parish marshes to keep it all as a nature reserve to stop people shooting. So we had 200 acres altogether. 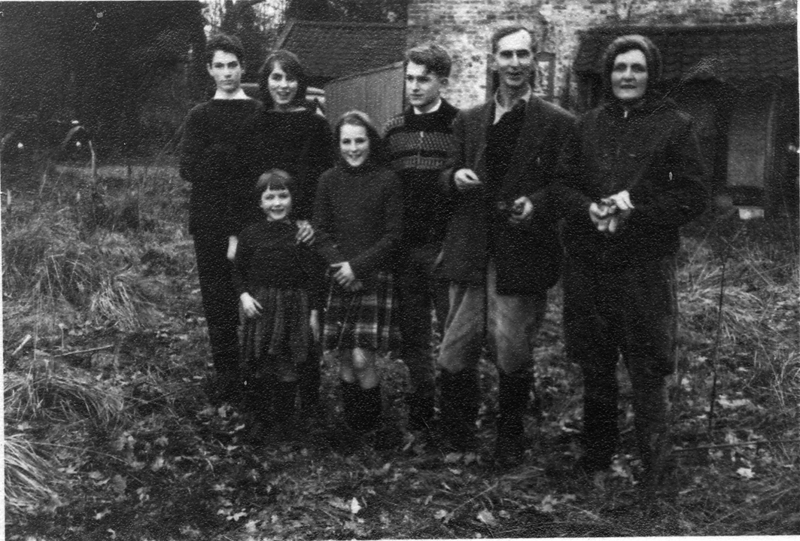 When dad died in 1986, mum and some friends set up a trust which bought the land off mum. It wasn’t for a great deal of money and they’ve run it since. They always had a pretty open door policy on the land as well; we never had ‘trespassers would be prosecuted’ signs and people with an interest have always been welcome. They raised enough money to put in the bank for some interest and pay a warden. We have a new, young and enthusiastic warden now: Will. We used to have quite an old demographic in terms of visitors; now there’s a strong demographic of young people and their families. My daughter, Rose, runs a forest school which may affect the visitors we have now because she’s encouraging the parents of young children to bring them. She has children of pre-school, primary and secondary school age now doing some forest school work and learning on Saturdays which is going well. Rose continues the family tradition of education and nature. Rose’s husband, Dan, is a water scientist for the Broads authority. They’re the ones who have kind of sacrificed their lives to Wheatfen. My parents were often offered much better financial opportunities. Dad was offered amazing jobs, but they chose to live the primitive life here and scrape by carrying on their ideals. My father was born in Guernsey and his younger brother Martin; his older half-brother, Percy, was presumably born in Great Yarmouth or Gorleston. My grandparents went to Guernsey on their honeymoon and decided to live there. My grandmother was an artist who did amazing work. In later life she made very beautiful embroideries. They’re like water colour paintings but made of wool. Amazing and very original; never seen anything like them. Living on Guernsey they had a nanny for my father and Martin. There are photographs of them being pulled in a goat cart. They played down on the beach and climbed the cliffs. Their mother would dress them in red jumpers so they could be seen from a distance. Grandfather was interested in Mendelism, cross breeding plants and breeding chickens, and he made a lot of copious notes. I think that’s how my father got some of his interests in the minutiae of plant genetics and things like that; the drawing and detailed observational skill from his mother perhaps. They both had a kind of almost microscopic view, like the old miniaturists. My father went to bed with the lizard in his pyjama pocket like Gerald Durrell. He and his brother had a very free childhood and endless pleasure on Guernsey which is a very beautiful place. I think he was about 11 when they went to live in Gorleston. He wasn’t at school for long. At 14 he worked in a false tooth factory which probably wasn’t good for his lungs because of the silica; he had a lot of problems with his lungs later in life. He had his ‘apprenticeship’ with Arthur Patterson the naturalist. Father kept a diary when he was 17 to 18; there’s a lot of his learning with Arthur Patterson in there like naming of species, and learning the Linnaean system. Father was a fellow of the Linnean Society and had a complete grasp of the system. He typed Arthur Patterson’s work and went to night school to take his typing exams. When Arthur Patterson passed on I think father took on a lot of the work, so that’s when he started writing newspaper articles. 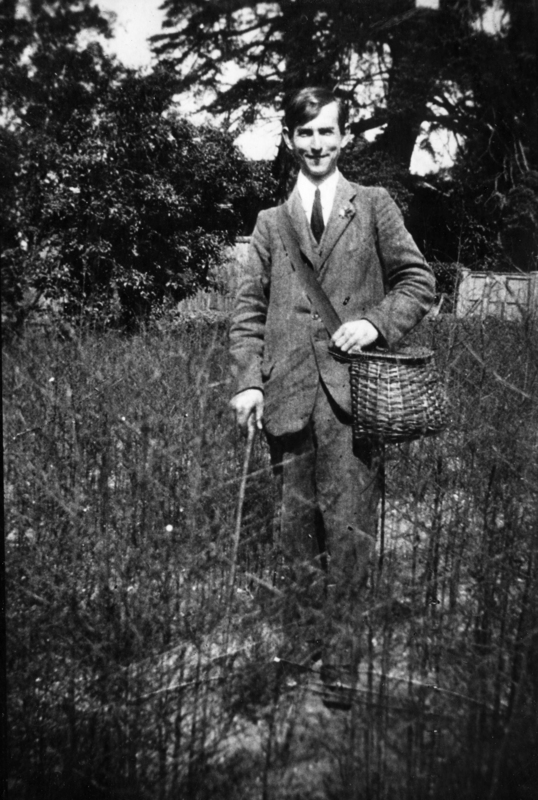 He revived the Yarmouth Naturalist Society as a teenager. He had this phenomenal retention of a fantastic amount of information and very good at collecting information in the things he was interested in. It’s like being a space man but the other way around; you’re looking down a microscope but still understanding worlds. In the 1960s, my brother John was stationed in Singapore and bought a lovely Pentax camera; it was when father took up photography. We have 20,000 positive colour slides. He took photographs mainly of natural history subjects and some of patterns like ice and cloud formations. There were a lot of things he thought were beautiful like parasites on wasps! There were the endless slide shows. Once we had electricity he could show his slides. We sat down and were shown the latest slides which were lovely but sometimes we didn’t really feel like it. He did lecture but most of his work was writing articles for the paper. He was one of the country diarists for the Guardian, and wrote almost every day for the local papers, such as The Young Naturalist, In the Countryside, Down Natures Byways as well as writing for various other publications. He went to Bristol for recording Nature’s Postbag on Radio 3. He was on Look East and he did a natural history spot for the Friday night programme Weekend with John Mountford. From my perspective his experience of life was going out observing things, making notes, referring to his vast library of books, and connecting information. He was like a proper researcher. He discovered various micro fungi like one on the bog myrtle catkins. He realised there were fungi which were hosted by catkins and thought the bog myrtle had catkins but didn’t seem to have a fungus. He looked very closely and found one; it’s named after him. He was very academic although he left school at an early age. He was also poetic and wrote in his own way: flowery, conversational and celebratory. It was sometimes very ornamental, embellished and Victorian. He went into quite detailed, almost passionate, description of something that he thought was stunningly beautiful or moving. He could also write scientifically and UEA gave him an honorary doctorate in 1971. He was a communicator and had a lovely articulate, tenor speaking voice. He was a good broadcaster and charismatic, and people liked him. As his children we found that difficult to believe, but I think it’s because he had a genuine passion for his subject and people were drawn to his emotional connection to it. Mum taught on the Isle of Dogs in the 1930s when she was a student at Goldsmiths. She saw the Jarrow marchers with cardboard wrapped around their bare feet. She taught a class of sixty who had no underwear; she went out, bought cotton and taught them to make their own pants. I think mum was a real socialist and believed in an equitable society. Thinking about dad’s parents, they were kind of aristocratic. I think his dad had a small private income. His mother’s father was a jeweller who had a fantastic emporium – a massive goldsmith’s – in Hanover Square, I think. He had a lot of children; some by his wife and some by his housekeeper. Grandma didn’t inherit money, some perhaps, but her parents were very well to do. Both came from moneyed backgrounds and a sort of French aristocracy behind it. They were sardine canners in Marseilles or something and her grandfather was a French chronometer maker. My father had a bit of aristocratic whiff to him, I think. I wouldn’t call him a Tory because he was really down on farmers using dangerous pesticides and phosphate. We now know these things go through to the water table. He certainly didn’t like the way the government funded the decimation of the hedgerows. He was not keen on many of the Tory government sponsored farming practices and saw them as dangerous. He came out with some premonition about how washing liquids and detergents would destroy our water ways because the sewage systems were not in place to deal with this. He was completely right and was threatened with legal action for publicising that point of view. As an ecologist I’m not sure you can be a Tory, because if capitalism is in charge then ecology is the last thing you are going to consider. What I would call Trumpism would verify this. He thought a lot about this, but I don’t think he was a socialist. He was kind and generous but bound up with his subject, whereas mum was more bound up with people. My father was offered a knighthood which he told us that he turned down because Sir Arthur South, the Norfolk furrier, had been offered one the same year; he stood for what my father disagreed with. I think dad just couldn’t be bothered in a way. He didn’t particularly want the pomp and circumstance. He had rejected very good jobs in London: the Mycological Institute and Survival when if first started because he didn’t want to travel around the world. It’s amazing he lived to 77 because he had bad health: he had tuberculosis and suffered from quite disabling sickness in his life. He was quite happy on his fen doing what he could. My mum felt she was betraying his memory by accepting an MBE; she accepted because of the Ted Ellis Trust because it would be good publicity. She had this old hand painted silk suit which belonged to Helen Brotherton’s mum, a rich woman who was about ten times bigger than mum. It hadn’t been worn since 1940 and was wrapped in a bit of tissue stinking of moth balls. She thought it would do, not mentioning the custard and gravy stains still on it. She needed a hat to match the nice maroon shoes she wore. I offered to buy a £20 hat we saw while shopping but she thought it was too dear. ‘I’ll go to the 50:50 shop. I’ll get a hat from there.’ She bought this oversized navy-blue hat for £20, so she could take it back later and the charity could get some more money for it. She had this great hat pin sticking through this mismatching hat to keep it on her head. We went down on the train and stayed at my daughter’s the night before. She was at Kingston University, living in this damp basement flat in Fulham, sleeping on mattresses on the floor. Her friend gave her room to mum. In the morning mum was wearing an old anorak covered in paint and stuff. We forced her to wear my daughter’s size 10 coat. The taxi driver didn’t believe we were going to Buckingham Palace. The MBEs were given out in this room with a moth-eaten red velvet throne with gilded plasterwork. It had a musicians’ gallery, a military band but the piano, oboe and clarinet were out of tune. They played eight numbers from musicals on repeat. I thought ‘poor Queen, I hope she’s tone deaf ‘. There was an emissary, who looked like Kenneth Williams, passing the medals on a cushion and making comments. Poor mum was 83 and queued for about three hours standing up in a long corridor. She said she had to lean against the wall and there was nothing to drink on offer. It was like get in, get your medal and get out. I hoped mum would do the bowing thing which she did. The Queen said something to mum. I could hear mum, because of her false teeth there was a whistling. I saw the Queen’s face drop and wondered what she said. We sat out in Hyde Park having tea in a polystyrene cup from a van. I asked mum what she said to the Queen. ‘Well, she said ‘I see you got your MBE for services to the environment’. I said ‘no, I think you’ll find it’s for services to conservation.’’ To mum services to the environment would mean like water company, sewage or something like that; whereas services to conservation was much more important. So she argued with the Queen; that was her all over! Suzie Hanna talking to WISEArchive 26th July 2017 at Wheatfen.